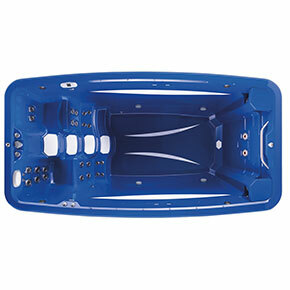 Spacious, powerful, and versatile — Aquatic Training Vessels™ by Marquis® deliver the ultimate swim spa experience. Engineered to perform in a variety of aquatic scenarios, from intense training, to gentle conditioning and fitness, to stress-free relaxation and playtime. ATV™ adapts to your fitness level and goals, whether you are an athlete, outdoor enthusiast, or simply love the water and want a fun place to relax. You have the ability to get an intense aquatic workout with the hydrodynamic flow behind the 6 dual-speed turbo jets that come with ATV-14 Sport, but in the same compact 14 foot size as the ATV-14 Splash. Enjoyable swimming and fitness with enough room to party. Enjoy a mild aquatic workout, increase your range of motion, play with your family, or relax with the therapy massage seats. Imagine a swim spa designed for social interaction and fun, with the extra space and power you need for aquatic therapy and heated-water exercise. Enjoy party time with your friends, quality time with your children and grandchildren, and quiet time with a partner. 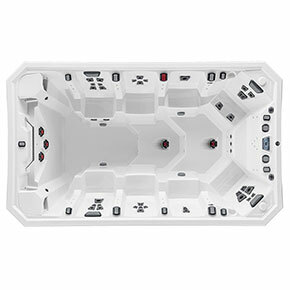 If a lap pool and a hot tub got together and had a baby, it would be the V150 Swim Spa.